Why rebreather divers, even more so than open circuit divers, need to be in control and focused when they ascend. One of these concerns is a widely misunderstood phenomenon most frequently referred to as shallow water or hypoxic blackout, something that hitherto has typically been a problem encountered mainly by free divers. A technique many free divers practice to extend their time underwater is hyperventilation. They breathe in and out aggressively to reduce their carbon dioxide levels as much as possible. This causes the breathing reflex and onset of anxiety to be delayed while they are underwater. Then they dive. As they swim their bodies metabolize the oxygen and convert it into carbon dioxide and the longer they are down the more oxygen is metabolized. Human beings can function normally at oxygen partial pressures of between 0.16 and 0.5. At partial pressures greater than 0.5 we are at risk from oxygen toxicity: at partial pressures below 0.16 the oxygen level is insufficient for us to maintain consciousness. At the surface, the oxygen partial pressure in the air the free diver breathes is 0.21. When he arrives at 10m (33ft), generally speaking, the percentage of oxygen in the air in his lungs is still 21 percent, but as he is now at an ambient pressure of two atmospheres and as the pressure of the air in his lungs has now doubled, the partial pressure of the oxygen in his lungs is 0.42. This partial pressure then starts to drop and continues to fall as the oxygen is metabolized. If the diver stays at depth until the partial pressure drops to 0.28, he is fine, but this equates to a partial pressure of only 0.14 at the surface. So, as he ascends and his oxygen partial pressure drops with the reduction in ambient pressure, somewhere at a point close to the surface it will fall below 0.16, the diver will black out abruptly and, if he is not positively buoyant, will sink back down to the depths. Rebreather divers can encounter similar issues as they ascend. 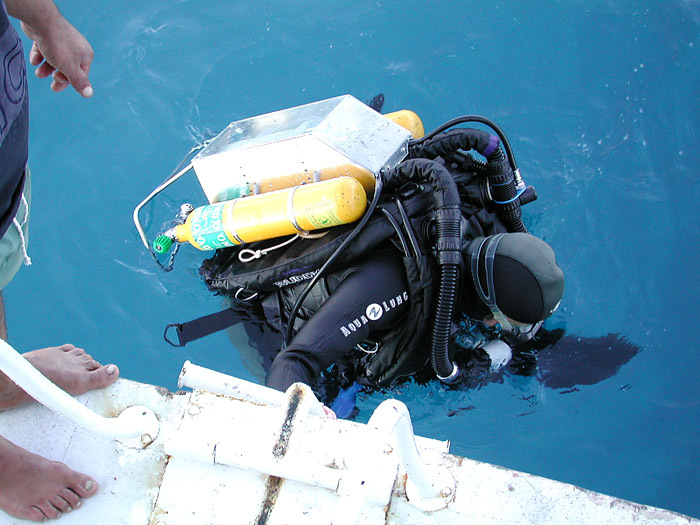 On most electronic CCRs, the oxygen level in the diver’s breathing supply is maintained at a preset level. As the diver ascends, the ambient pressure drops as does the partial pressure of oxygen in the diver’s breathing loop. When the rebreather’s electronics detect that this is happening they direct a solenoid to allow a fresh injection of oxygen into the loop to maintain the partial pressure at the desired level. If the diver’s ascent is too rapid, however, the electronics may not have time to pick up and compensate for the oxygen shortfall. Furthermore, if the oxygen cylinder is empty or if corrosion or other debris is blocking the injector then no oxygen can be added, no matter how controlled the ascent. If the diver does not monitor his oxygen partial pressure and act to manually sustain a breathable oxygen level by, for instance manually injecting fresh diluent gas into his breathing loop, he will black out before he reaches the surface. It may well be that this phenomenon lies behind a number of unexplained rebreather fatalities in recent years. With very few exceptions, we all begin our diving lives on open circuit scuba and acquire open circuit habits. It is common in standard no decompression sport diving for divers to relax their vigilance once they begin their ascent. The dive is over and their attention starts to wander. It is also natural for a diver who encounters a problem or feels uncomfortable to quickly seek sanctuary in the shallows. After all, this makes good sense in open circuit terms because the shallower you are, the less air you use and the more time you have to solve any problem. Simon Pridmore is the author of Scuba Confidential: An Insider’s Guide to Becoming a Better Diver, which will be available from Best Publishing Company in late 2011. See www.scubaconfidential.com for an advance preview.